Account executive Callum Begg sees opportunities for endless cash if he can only ever work out what the client wants or who the client is. The party is dumping one failing PM and welcoming the return of another to rescue the situation in the shape of a smiling Blair-type figure. But whoever is in charge, Begg is the man with a plan – and a matrix, and a file full of research, lots of grids with pretty colours, slides saying the right thing. He and his flaky team have worked out how to fine tune each message with just the right level of emotional intensity for every audience. Find out what people are most scared of and promise to fix it. Not really you understand – just fool as many of the people as it takes to get elected, mesmerising them with images. It's a pitch the politicians want to buy. But Callum is falling apart and it might not be just the shifting sands of the brief, the self-inflicted loneliness, the drinking, the firings at the bottom and the slimy boss above. There may be another and more sinister side to his growing madness. Because another strand is being secretly woven into his campaign, delivered by a shady academic duo that've worked out how to wring emotions and twist minds. Maybe Callum's own brief encounter with them is adding to his craziness. The government might want an extreme feel-good factor for the people, but every real person who gets close to this evil crew is feeling worse and worse. You know things are spiralling out of control when even the hard-nosed government fixer is twitching at your feet and the Minister for Well-Being is suicidal. This rapid read could have done with more depth in the characters and a sharper political context. We're not asking for an economics lecture, but a bit of real life context siphoned from today's massive economic, social and political crisis would have made the whole thing seem more real. Perhaps this absence is not surprising, since everyone involved is setting out to obscure reality behind a tawdry web of images. A clearer explanation of the motives of the deadly duo would have been welcome too. 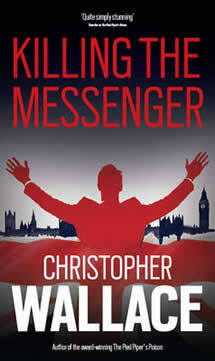 But this page-turner has a strong central idea that works as political symbol as well as political thriller. None of the politicians have any concept that they might actually do us some good – they just cling to power for its own sake. Sounds horribly familiar!